Located on 400 stunning acres that reflect the natural beauty of Maryland’s Eastern Shore, Adkins Arboretum provides the perfect setting for weddings. 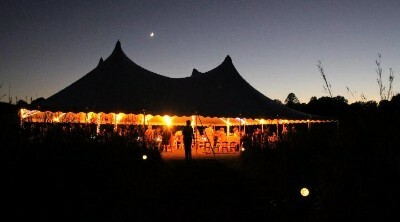 Whether you're looking to say “I do” under a canopy of trees, sip cocktails on the bridge, or dance beneath the stars, nature lovers will enjoy choosing from a variety of scenic landscapes to celebrate their big day. Our friendly and knowledgeable staff is ready to help throughout the Arboretum experience. Located in the Arboretum Visitor's Center, this inside space is perfect for smaller gatherings of up to 50 people. Central air, carpeting, wi-fi, and restrooms are available. An ongoing series of artwork on natural themes by regional artists is on exhibit throughout the year. Measures 26’ x 26’. Our open pergola features wooden beams and gorgeous paver stones interlaid with brick. Supporting columns are ideal for decorating. The pergola overlooks native meadows and adjoins the Arboretum Visitor's Center and gallery. Measures 27’ x 22’. A truly unique setting, the wetland boardwalk provides its own springtime serenade of native frogs. 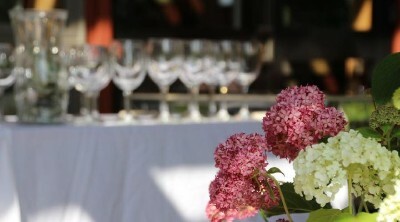 Red-winged blackbirds, butterflies, and the occasional heron may join your guests as you celebrate. 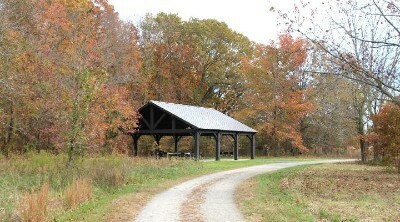 The wetland boardwalk is located alongside the entrance to the Visitor Center. Measures approximately 27’ x 26’. 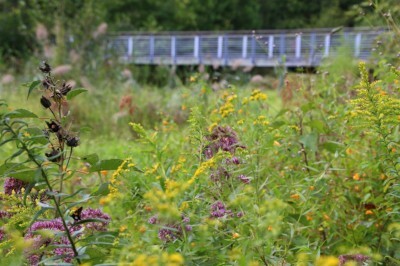 The entrance bridge spans the Arboretum’s wetland, where cattails, black alders, bald cypress, and other native plants provide shelter for a variety of wildlife. This unique site could be the setting of an impressive banquet or promenade. Measures 179’ x 10’. Located across from the Visitor’s Center, the Magic Meadow is an ideal location to admire the sunset or a multitude of evening stars. The native grasses that surround this cleared space are lushly green at the height of summer and golden in the fall. Tent not included. With a view of forest on one side and meadow on the other, the six wooden picnic tables located at the entrance to the woodland paths are crafted of cedar and can seat up to 36. In addition to their proximity to the paths, the tables are just a short walk from both the Visitor's Center and the pavilion. This rustic woodland theatre, located along the Arboretum’s woodland paths, offers log seating for 20. The theatre is surrounded by young forest comprised of pine, sweetgum, and oaks with a mossy floor. In early May, pink lady slipper flowers bloom just down the path. A golf cart and driver are available to transport guests upon request. Plentiful parking is convenient to all locations. Adkins Arboretum is a proud supporter of marriage equality. Fees vary depending on event logistics. For more information and to set up a visit, contact the Arboretum's Assistant Director, Jenny Houghton, at jhoughton@adkinsarboretum.org or 410-634-2847, ext. 23.